LANDIKOTAL: Malak Nadeem Afridi, founder of Karwan-e-Khyber speaking to gathering on Thurday in Landikotal bazaar. 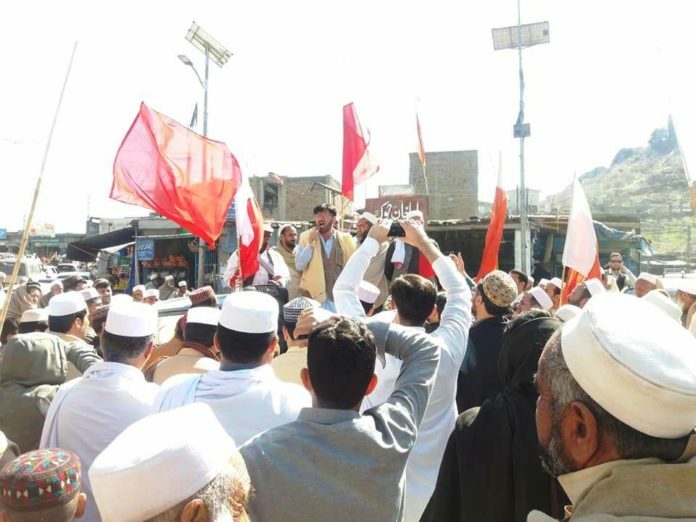 LANDIKOTAL: Residents Thursday hold a protest demonstration in Landikotal bazaar against the Pak-Afghan road blockage and slammed the poor role of the civil administration to resolve public issues. 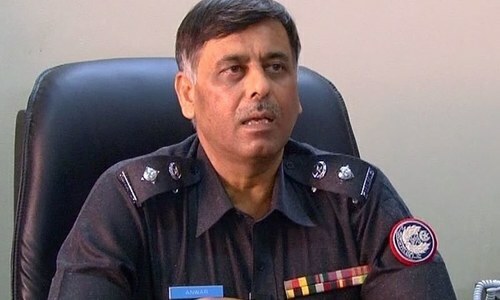 The protesters were holding flags and placards chanted slogans against the Assistant Commissioner( AC) of Landikotal Muhammad Imran. The protest led by Malak Nadeem Afridi, the leader of Karwan-e-Khyber. Nadeem Afridi, Malak Bahadar Shair Afridi, Farid Shinwari and Manzoor Shinwari delivered their speeches on the occasion. The protesters said that Landikotal AC was indulged in useless visits and in photo sessions and not interested in the public issues, adding that he ignored the real issues of the area due to which the masses were facing hurdles. Regarding traffics blockage at Pak-Afghan road, they regretted that the tehsil administration has failed to provide safety to the area residents and transporters. They said the civil administration has failed completely to deliver as it could not to resume traffics on the road which has been blocked by some interest groups for the last five days. “ The toll plaza on Kata Koshta area is a legal project as the Peshawar High court has permitted them to operationalized the toll plaza. But the silence of the administration on the issue is meaningful which they sternly condemn,” said Nadeem. The protesters accused that while Dr. Noorul Haq Qadri and Shahji Gul have played their role the issue but Senator Taj Mohammad was on the back of AC Landikotal to sabotage the toll plaza project. They appealed the government to take measures against the people involved and threatened to stage a huge protest if their demand were not fulfilled. A Transporters’ group led by the Khyber Transport Association president, Shakir Afridi have been protesting and block the road for Afghan transit vehicles for five days against tax collection on the toll plaza established at Peshawar-Torkham road in Kata Kushta area in Landikotal.